Something good HAS to come from all of this. 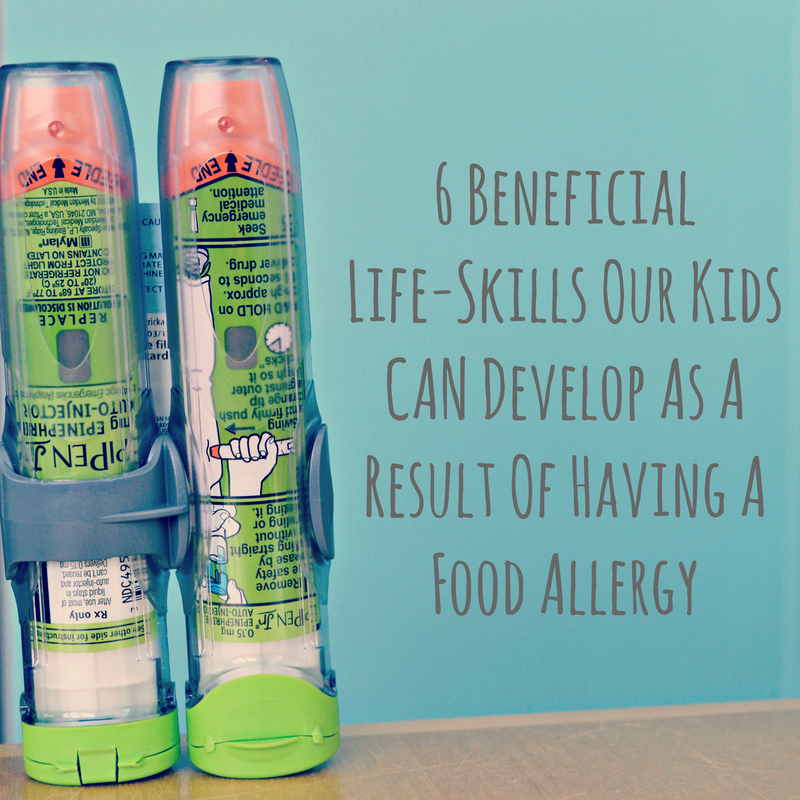 6 life-skills kids CAN develop as a result of having a food allergy. I admit, calling out ‘benefits’ of a food allergy may be putting on rose-colored glasses. But this mama needs to see good comes from such strenuous effort and challenging experiences. I need to know there are things I can do to help my child thrive in the midst of something very serious and not-so-fun. Food allergies can be incredibly scary for parents and children who live with the reality that food can cause harm. In no way, am I saying food allergies are desirable; all of us would rather not deal with them and put our Epi-Pens prescriptions to rest. What I AM saying is this: as parents of children with food allergies, we are charged not only to teach our children to navigate food safely, but also to make the most of the experiences they encounter. Of course, this is also true of parents whose children do not have food allergies; we need to make the most of WHATEVER experiences they have. What does that mean for us? It means we praise and encourage skills and character traits that are both required for safety and developed as a result of having a food allergy. All those lessons in label reading, asking questions and in developing personal discipline and responsibility can be an opportunity for you, your child, and family. Despite our fears, and the harsh reality when a reaction occurs, something good can and will come of all of this, if we are committed to it. The key word here is can. While a select few children will harness these skills on their own, most need our help. We help them apply their food allergy skills to other areas of life. Instead of raising children who view their allergy as a hindrance, we can help them see it as an experience that taught them life lessons and skills they will actually use as adults. As we teach the skills they NEED to keep themselves safe, we can champion their efforts, recognize their growing independence, and encourage their empathy for others. Before listing skills and character traits we can encourage, we must first ask ourselves: How do I view my child’s allergy? What do I convey to my child? Do my attitudes, words and actions reflect that I am annoyed with it, frustrated by it, or hindered by it? Our kids are watching, learning from US how to act. Our attitudes must show we will make the most of this. We must make it our goal to equip, empower and trust these little ones; first we trust them with a little, then step by step, we will have to trust them a LOT. They won’t be in our care 24/7 for very long. Our kids’ safety and attitude starts with US. It is my goal to make sure our child knows I am in their corner. Our kids must know we are doing what We NEED to do to keep them safe. At the same time, they need to do the same. There are times when a feeling is hurt, a food can’t be eaten, a child is excluded, or a reaction happens and all they need is someone to grieve with and to be comforted by. I’m there. The rest of the time, I want to be sure they know to be proactive and take necessary precautions, but to also ENJOY life. I want them to tangibly know what they are learning from their food allergy, and how they will succeed in other areas because of what they’ve learned and endured. In a society filled with wide availability of sugar, fat, and sodium packed foods, there is value in knowing what we put into our body MATTERS. Children with food allergies and their parents KNOW this on a whole new level. Why not use this heightened food-awareness as a stimulus for life-long healthy eating habits? Label Reading Fosters Wise Decision-Making: In general, the more food is processed, the more likely it can be cross contaminated with a food allergen. AND the more likely it is loaded with less-than-healthy additives. Diligence is key and can be taught NOW. We can teach our kids to read labels not only to check for an allergen, but also to see if it is healthy. Food allergy kids and parents have to read the label anyway, so why not read it and make wise decisions together? Whole Foods are Safer and Healthier: Even with diligent label reading, recalls tell us the label isn’t always right. WHOLE, RAW fruits and vegetables and plain, unflavored meats are safest. Not only is the raw food less likely to be contaminated, but is packed with natural nutrients. They are also free from strange chemicals with complex names that I used to use for science experiments in the genetics lab. Cooking at Home Promotes a Love Of Cooking: Watching and helping a parent cook creates lasting memories and imparts life-long skills. Sure, it takes longer to let a 4-year-old help, but it is worth it. I hope his future wife appreciates that he will know how to cook before he moves on from this house. Knowledge is Powerful: A child with a food allergy and their siblings simply HAVE to know more about food than others. It goes with the territory; they know about cross contamination, manufacturing, and how reactions happen. It is my hope that knowledge about how allergies work will someday generate curiosity about science and drive our children to search for their own answers. Passing on Dessert is a Good Idea: As adults, we all know that passing on dessert is a good practice. In an allergy household, pre-made desserts can be particularly difficult to find allergen-free, so baked goods a rare treat. Instead, fruit at the end of our meal has become our go-to dessert; grapes, blueberries, and strawberries are the coveted ‘treats’. These kids won’t expect a baked or creamy treat after every meal because they did not grow up that way. Any child who has sat alone at a nut-free table, been excluded from an activity or treat, or had an allergic reaction knows how important it is to have the support of others. Or, even better, someone to step into it with you and pass on dessert WITH you. When they see others going through their own struggles (food or otherwise), it is my hope they will be better equipped to come alongside others and meet them where they’re at. As parents, we can guide and encourage our children to reflect on how they have felt in similar situations. We can teach our kids how to ask questions to understand what others are going through, and how to stand by them and lift them up. It excites me how this will affect them long-term. These kids are going to be some of the most kind and loyal friends out there. Many of us take the freedom we (and our kids) have to eat whatever we want, for granted. Our family never will again. We feel the occasional pang of jealousy or disappointment when a nutty treat is being passed around. And frankly, it will hurt when we see our child hurt. We will also be proud when he makes the right choice. Because of the hard moments, we have learned that where disappointment and self-control is great, so is delight, surprise, and gratefulness when it goes the other way. When someone makes a special effort to buy or make a dessert my son can eat, it brings delight; he knows it is really special. We recently attended a birthday party where a parent did her own research and found a store that will sterilize all their equipment to make nut-safe cupcakes (you know who you are-THANK YOU isn’t enough). When that nut-free cupcake was placed in front of my son, he looked at me and said, “But mama, doesn’t it have nuts?” First, I was proud he asked on his own. Then, it was my pleasure to explain how his friend’s mom had gone out of her way to make sure he could have one. His surprise was evident and the look on his face was so sweet. To say he was grateful is an understatement. He will always know it is a privilege when someone makes a special effort on his behalf. These lessons foster a sense of gratitude only experience can teach. I recently read this article, which states that children may develop helplessness from their food allergy experience. Sigh. Initially, I was offended. But as I read the whole article, I saw how my PARENTING will largely decide whether this is true. Fear and the knowledge of the danger in food makes it hard for me NOT to control every aspect of our child’s food and environment. While we need to do our part to keep kids safe (and do it WELL), we also need to make sure they are learning to do the same on their own. The article did change my thinking and motivate me. Instead of asking all the questions for my son, we need to help my son learn to ask questions, NOW. This doesn’t mean that we don’t keep asking those food allergy 20-questions before we get together. These questions still need to be asked and I will continue to advocate for my child! However, it DOES mean we need to take the time to help our child learn WHAT to ask, WHEN to ask (always), WHY it is important, and HOW (respectfully, kindly) to ask. In essence, we need to equip our kids to practice self-advocacy. As they learn this skill, it will be our job to show them how to use it in other areas of life, and on behalf of others. There are just some things that parents can’t provide on a life-changing, fulfilling level; we are limited, but God is not. When a child finally understands the gravity of what a life-threatening food allergy means, they will need all the hope, comfort and faith they can get. This can only come from a life-changing faith in Jesus Christ our savior. Telling our kids when we pray for them is important; they should know the prayers being said on their behalf and understand their parents are putting their trust in the Lord’s protection. As children get older and express their own fears and frustrations, it will be time to share some of our own. We must show them how we have worked through fears with the Lord’s help. Being honest about our struggles and how the Lord helps us will be a powerful example for them to emulate. We will teach our son that no matter what happens, the Lord will be with us ALL as we walk through it. When our children grapple with their own fear and discouragement (allergy related or not), we WILL turn their faces towards the One and Only God. We will teach them verses about worry, God’s protection and our reliance on Him to meet our needs. We will demonstrate what faith looks like; how we need to do OUR part (wise choices, proactive planning, and carry medications), and then, when we can do no more, how we rely on God to do HIS part. I can’t think of any better skill to equip them with. A child with a food allergy is responsible for a LOT, at a young age. They need to be aware of their surroundings, what is in EVERY bit of food or beverage they consume, and are responsible for expensive medications they will need to know how to self-administer. Our kids have a lot on their plate. They need our encouragement, guidance, and TRUST. They need us to equip them as best we can, making sure they understand consequences. We need to pray for them, and let them go into the world where we can’t control everything. Whether it’s to school, a friend’s house or an activity, they need to be able to go! I feel like this goes without saying, but, when they return from [insert activity], we need to hold them accountable. We will ask questions about how they made decisions and we will praise their efforts to be safe, correcting when necessary. When we make it to the Epi-Pen expiration date and not only has it not been needed, but they haven’t lost it, froze it, or heated it up, it is worth celebrating! As parents, teachers, or their friends mention how our children are being diligent when we’re not there, we need to tell them how proud that makes us. These are just 6 skills; there are plenty more. Our experiences can make or break us. We can make sure our children’s allergy experiences (good and bad) are a starting point for something wonderful. There is no doubt these lessons will take time and effort. It will often be faster to just do things for them. But, bear with it. The long-term outcome will pay dividends; not only will they be safe, but they will excel in many areas as a result. These skills will benefit any child, whether they have allergies or not. All these skills can certainly be learned by any child. Our food-allergic children and their siblings require them. Oh, our children are going to be some neat kids! And, I can’t wait to see them as adults. Truly LOVE this article! Thank you for your positivity! My 6 year old has a peanut allergy. It’s been a constant source of anxiety for me since we found out 5 years ago! Great reading and encouraging! I understand this feeling well, Sara! I’m so thankful God is with us as we navigate the world with the knowledge of food allergies our children have. Without Him, I think my own fears would take over. But God is faithful, our kids’ allergies are not a surprise to Him and He loves them more than we do. It’s my prayer that God will ultimately heal our children, but also help us to trust Him with their safety and lives. It’s a daily struggle, sometimes minute by minute. Next Post Thanksgiving – Are You Feeling It?